Sullivan County’s home affordability index decreased for the second quarter this year to an 11-year low. The opposite was the case in Washington County during Q3. That county’s weaker wage growth and a decline in the median home price was enough to push affordability back into the positive range when compared to the historic average. An index above 100 indicates median home prices are more affordable than the historic average. An index below 100 indicates prices a less affordable than the historic average. Clicking on chart renders a larger file. Sullivan and Washington counties’ home affordability status and tracking are part of Attom Data Solutions Q3 U.S. Home Affordability Report. The report found U.S. home prices were at the least affordable level since Q3 2008 – a 10-year low and Sullivan County fits into that category. But as with some other data stories, there are mitigating factors that render the index a less than perfect affordability metric. 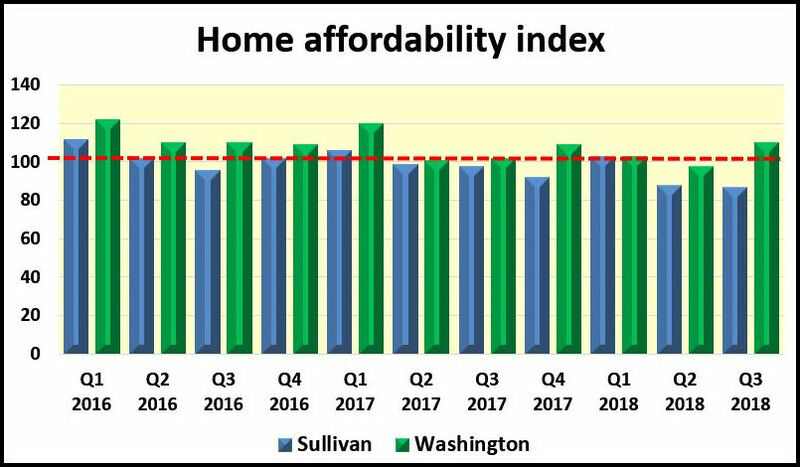 Still as the tracking chart illustrates Sullivan’s home affordability has been battered during its recovery from the recession. Attom’s report calculates an affordability index based on the percentage of income needed to buy a median-priced home relative to historic averages. An index above 100 indicates median home prices are more affordable than the historic average. An index below 100 indicates prices a less affordable than the historic average. The full methodology is listed below. Nationwide the Q3 index was 92, down from 95 in Q2. The most recent index is at its lowest level since Q3 2008 when it was 87. The nation’s least affordable index was Q2 2006 when it was 66. Sullivan County’s Q3 index was 87 down from 88 in Q2. That’s the lowest it has been since Q3 2007 when it was 81. The least affordable index was 77 in Q2 2006. Washington County Q3 index was 110, up from 98 in Q2. The current index low Q2 2018. The least affordable index was 71 in Q3 2007. Attom’s data show the median home price in Sullivan up 9% from last year and down 11% in Washington County. Unlike local home price reports from the Northeast Tennessee Association of Realtors (NETAR), Attom’s data come from public records instead of sales of properties listed on the local Multiple Listing Service. Typically, MLS accounts for about 75% of real estate transactions. Locally the report shows the annual income needed to buy a median-priced home with 3% down payment and a 28% front-end debt to income ratio in Sullivan County was $34,460 and $35,897 in Washington County. Those prices represent 20.3% of the annualized income in Sullivan and 24.6% in Washington County. The historic percentage of wages to buy in Sullivan is 17.7% and 27% in Washington County. Despite the affordability index status in Sullivan, the percentage of annual wages to buy is below the 30% level. That’s the point when owners are considered housing stressed. The average wage earner in both counties could have qualified to buy in both counties in Q3 assuming their credit rating and front-end debt to income ratio met the assumptions used by Attom’s report. Nationally an average wage earner would not qualify to buy a median-priced home nationwide and in 368 of the 440 counties analyzed in the report. Much of the local home affordability issue rests with wages, a tight resale inventory, the lack of affordable new homes being built and new residents who are cash-rich from the sale of a previous home relocating here. The Tri-Cities has historically had the lowest private sector average wage in Tennessee. Local business and civic officials have touted the region’s low cost of living as a balance to wages that are typically lower for comparable jobs in other areas. And even though the region is full employment many wages have remained stubbornly low. But home prices have increased. Some of that driven by pent-up demand and an accelerating number of residents fleeing higher tax states. Attom’s report cites 2017 Census migration as part of its affordability report. During that year Sullivan County has a net migration of 1,231 new residents while Washington County saw an increase of 579. That’s a reversal from the past several years when Washington County accounted for the bulk of migration. At one time the city of Kingsport made Move To Kingsport data on new residents public on its website. That data tracked new residents, whether the relocated in the city or the county and whether they bought homes or rented. So far this year, city officials have not responded to repeated requests for the 2017 data. Complicating the home affordability index situation – but adding context to the issue – is the region’s the lack of quality of jobs the local economy is producing, a rapidly aging demographic, a new home sector focused on mid- and higher-end homes, the rapidly increasing cost to build new affordable housing, and local governments use of tax incentives to encourage developers to build apartment complexes. Attom’s U.S. Home Affordability Index analyzes median home prices derived from publicly recorded sales deed data collected by Attom and average wage data from the U.S. Bureau of Labor Statistics in 440 U.S. counties. The affordability index is based on the percentage of average wages needed to make monthly house payments on a median-priced home with a 30-year fixed rate mortgage and a 3% down payment, including property taxes, home insurance, and mortgage insurance. Average 30-year fixed interest rates from the Freddie Mac Primary Mortgage Market Survey were used to calculate the monthly house payments. Only counties with sufficient home price and wage data quarterly back to Q1 2005 were used in the analysis. The report determined affordability for average wage earners by calculating the amount of income needed to make monthly house payments — including mortgage, property taxes, and insurance — on a median-priced home with, assuming a 3% down payment and a 28% maximum “front-end” debt-to-income ratio. For instance, the nationwide median home price of $250,000 in the third quarter of 2018 would require an annual gross income of $72,791 for a buyer putting 3 percent down and not exceeding the recommended “front-end” debt-to-income ratio of 28 percent — meaning the buyer would not be spending more than 28 percent of his or her income on the house payment, including mortgage, property taxes, and insurance. That required income is higher than the $55,926 annual income earned by an average wage earner based on the most recent average weekly wage data available from the Bureau of Labor Statistics, making a median-priced home nationwide not affordable for an average wage earner.